April 15 marks the one-year anniversary of the 2013 Boston Marathon, a day in which shock and tragedy shook an event that is beloved by Wellesley and by the world. The following days were marked by a profound sense of loss as well as more violence and confusion, but also a sense of solidarity with the city, and thanksgiving for the many who risked their lives in order to protect others. This year, Kat Goldsmith ’16 has many reasons to reflect. Goldsmith is the only Wellesley volunteer on the MIT Emergency Medical Services (EMS) team. She and the other 55 students who run the ambulance services received the first annual Collier Medal from MIT in recognition of their quiet, excellent service to the community. 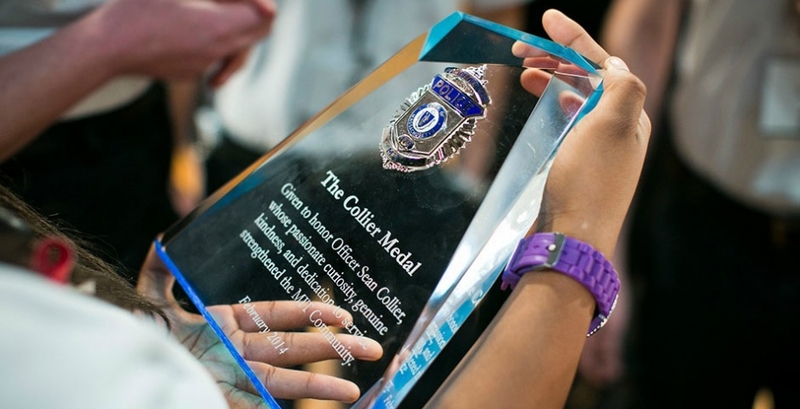 The Collier Medal was established to honor the memory of Officer Sean Collier, who was killed on duty during the week of the marathon. The award was presented in February of this year. Wellesley is enormously proud of and thankful for Kat’s dedication to serving others. We asked her to share her reflections about volunteering with the MIT EMS ambulances, meeting Sean Collier, and honoring his legacy. Currently I am the only Wellesley student on the MIT EMS service. There have been some other students before who have been on the service, but they have so far been unable to pass what we call being a "3rd rider," which is the training rider position. I have managed to reach the rank of "2nd rider," which requires promotions within the service by the executive board. As such, as well as representing myself, I often feel like I am representing the Wellesley community. Frankly, when I joined, none of the members of the service thought I would last. They were all surprised when I continued being a presence and trained constantly in order to become a better EMT. I had to study more than every other person in the service, because as well as all of the EMT skills, I also had to learn about a new campus, the surrounding city, and all the MIT-specific protocols. I had to integrate myself into a community that originally considered me an outsider, and in doing so I am hoping to create more opportunities in EMS for later Wellesley students. I volunteer about 20 hours a week, which is a bit difficult to balance since I am also the captain of the varsity soccer team and pursuing a double major. But I make it work, because I love every single minute. As for winning the Collier medal itself, I have to say that it was simply incredible. Sean was one of the first people I met at MIT who didn't care what school I went to. He friended me on Facebook immediately after I met him, before many of the other EMTs. He was there on some of my first-ever calls, always going out of his way to make sure that we as EMTs were safe and protected. He destroyed me in [the video game] Halo 240-0, and then stopped playing the next round just so he could give me tips. "Just keep practicing!" he told me. He didn't deserve an award named for him because of how he died. He deserved one because of how he lived. That Thursday night [after the marathon] was weird for me. I usually took the Thursday night shift, but had switched earlier that morning because the funerals from the Boston bombing were going to increase traffic. When I heard an officer was shot outside of building 32, I knew it was him. Our service, and my friend who had taken that shift as well as some of our peers responded to that call. They are all incredibly skilled EMTs, but there is still a weird part of me that felt like I should have been there. I don't think I could have made a difference, but there is still a part of me that has some survivor's guilt. I listened all night to the radio, but since they didn't release his name, I found out from his Facebook page at about three in the morning that it was him. When his name was released later that day, I felt lost. What ended up helping me a lot was actually running in Boston's Run to Remember, an annual run to commemorate those officers lost in the line of duty. This past year's run was in honor of Sean. My EMS service raised $10,000 in his name to donate to Dana Farber. I myself raised $3,000. Being able to do something to give back reminded me not to dwell on how Sean died, but what he would be doing, right now, if he were still alive. … The entire country knows Sean for how he died, and yes, he did made the ultimate sacrifice to keep all of us safe. But mostly, he was just an incredibly compassionate human being. He could make jokes with anyone and everyone. He went that extra mile with all the MIT students. And he never forgot to wave to the passing Wellesley student in the EMT outfit, who was probably lost or confused by MIT's building numbers. … Most of all, I'm so proud to be a part of a legacy—Sean's legacy. In tens and maybe even hundreds of years from now the Collier award will keep being given out, and people probably won't remember why it's called what it is or understand all that he represents, all that he was. But receiving that award, in that room, as I stood on a stage with my EMS family all around me, watching and hearing what would be the longest standing ovation and applause of the day (despite the achievements of all other award winners, who were all so impressive), I knew that everyone in that room understood. Everyone in that room knew what it meant to us to be the first to receive this award. To know that Sean would have probably been standing there too, clapping longer and harder than everyone else.